Schools from outside the US may contact a travel agent to submit an application to join the Honolulu Festival on their behalf. 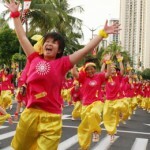 With over 5000 participants from Japan, Korea, China, Australia, USA, Canada and Taiwan and 30,000 people coming to watch; the Honolulu Festival is the largest cultural event held in the State of Hawaii. 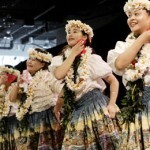 Cultural performance groups and school groups are invited to participate in the Honolulu Festival and share their culture with other performers, international visitors and the local community. For international groups, the Honolulu Festival can introduce you to the official inbound operator to assist with professional and economical arrangements of transportation and accommodation. 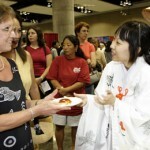 For students of English, Japanese, Korean or Chinese, the Honolulu Festival offers a great opportunity for students to interact using their learned language skills in a fun and interesting environment.